An innerspring mattress is the right mattress if you like sleeping comfortable and sturdy and like to have a mattress with optimal ventilation. The core of an innerspring mattress is formed by a large number of steel springs, which are interconnected with each other. 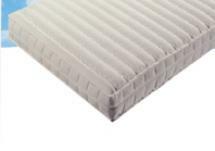 On both sides of the core, the mattress has a comfort cover layer. The thickness of this layer and the manner in which this is stitched through, partly determines the lying comfort and the price of the mattress. Important for the preservation of the mattress is to reverse these regularly.